With Z-Balloon Adventures, you are not restricted to flying in Des Moines or the Indianola Iowa area. A really great gift for that someone special! Have us do tether rides for your family at the family picnic and be the hero! Give away a balloon ride as a special reward or Thank You to your business customers! Just choose your area that you want to fly in and the date of your choice! All we need is a 200' x 200' foot square area to inflate and soon you and your friends are aloft and having the time of your life! Keep in mind some dates will be unavailable due to schedule restraints and some areas may be restricted due to airspace restrictions due to the TSA, but for the most part we can fly just about anywhere. Hot air balloon rides in Des Moines, Indianola and everywhere else in Iowa - Hot Air Ballooning in Iowa including such hot air balloon services as champagne balloon flights, engagements, weddings, anniversaries, scattering cremains, birthdays, gift certificates, hot air balloon sales, corporate hot air balloon advertising, balloon flight instruction, aerial photography, weddings, balloon weddings, advertising blimps, blimps and more! 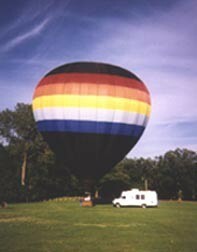 We're the launching point for your Iowa balloon ride. All pictures on this website are the exclusive property of Z-Balloon Adventures® and may not be used without prior written permission.